It’s that time of year! It’s Back-To-School time. The kids are groaning and the parents are rejoicing. But, we don’t want to send them off with a soggy sandwich and greasy potato chips. Let’s pack them healthy lunches so that they can be ready to learn (and help their immune systems fight off those pesky germs). In this article, we thought we would look at healthy lunch options for you and your kids. Many schools have dietary restrictions as to what your child can bring due to food allergies. So, please check your school’s policy before you make your grocery list. But, just because peanut butter may not be an option, doesn’t mean that your child won’t be looking forward to the bell ringing so that they can head to the cafeteria! Let’s think outside the box (or maybe inside the box would be better). 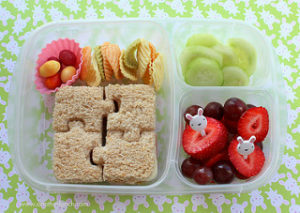 Many parents are choosing to send their students with a Bento box style lunch. Parenting magazine gives us so many great examples of these fun and imaginative lunches in their article entitled, “20 Easy Bento Lunch Boxes.” These fun treats have small helpings of several healthy options that your child will love. Most include a protein (such as lunchmeat and/or cheese) and fruit. Yum! It’s hot outside right now, but as fall approaches and the temperatures begin to drop wouldn’t it be nice for your child to have a warm, comforting bowl of soup? Invest in a good insulated Thermos and your child will enjoy a wonderful warm lunch. Pair that with a toasty grilled cheese sandwich and we can’t think of anything better to keep your child fueled for the entire day. Break out of the PB&J tradition and go for the CC&J! What is CC&J you ask? Well, Cream Cheese & Jelly, of course! As we mentioned earlier, many schools are requiring that lunch rooms remain nut free. But, that doesn’t mean that your student can’t still enjoy a jelly sandwich. Many children love a cream cheese and jelly sandwich (almost any flavor of jelly goes wonderfully) and for an added bonus…throw on some fruit, such as banana slices. Yum! United Medevac Solutions Provides Healthcare Staffing When Facilities Need It Most! Tired of making the exact same Ham and Cheese on bread every single morning? Why not ditch the sandwich and make a fun wrap? Grab a whole grain tortilla, add some lunch meat, cheese, and veggies and your child will never look to trade lunches with a classmate again. Does your child enjoy salads? There are endless possibilities of delicious salads that you could send with your child. Add some leftover grilled chicken to it and you have boosted the protein power! We hope that these healthy lunches for back-to-school have inspired you to think beyond the same sandwich, chips, and cookie. Lunch time can be healthy and fun too! We at United Medevac Solutions hope you have a wonderful and healthy school year. What healthy lunch ideas do you use when you are sending your kids back-to-school? We would love to hear from you!